This week I am attending Content Marketing World with 3,500 like-minded souls who are trying to network with other marketers, get educated on the latest trends in content marketing, and figure out how to justify the investment in content marketing to their boss. This is my 4th Content Marketing World, and I was honored to present once again. 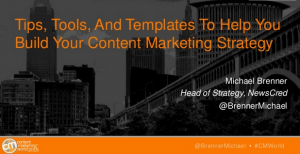 This time my topic was Tips, Tools and Templates to Build Your Content Marketing Strategy. The session was packed with nearly 500 people. The questions were flying. The gifs were animated, but most importantly, I did my very best to drop some knowledge on the crowd about a topic near and dear to my heart. Below you will find a copy of my presentation, free for anyone to download. And if you have any questions, or are interested in building your own content marketing strategy, please let me know.